Established in 2001, Party Poker quickly became the largest online poker site worldwide–known for its easy to clear bonuses and schools of poor players. Once they disallowed US players in 2006, Party Poker lost its top ranking and currently sits 5th worldwide in traffic (although it fluctuates near weekly). With a license by the governing laws of Gibraltar, Party Poker accepts players from all over the world including France, Spain and Italy (just not from the US). In 2011, Party Poker merged with Bwin to form Bwin-Party Digital Entertainment PLC and still offers an easy-to-clear and rewarding deposit bonus. At one time Party Poker hosted the largest tournaments and player traffic in the world but was always riddled with its poor customer support and software. 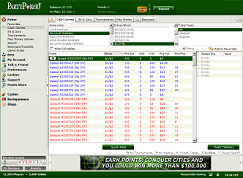 For years Party Poker refused to offer a rakeback or rewards program but tens of thousands of players still flocked there–the games were just too good. While all poker traffic has seen a decline in fish and a rise in smarter/better players–most of those players left Party Poker for better rewards options. For the remaining high volume players at Party Poker, the games could not be better. Keep reading our Party Poker review below for more information on the rewards program, deposit bonus and any new updates that have come out at Party Poker. Yes–Players can earn up to 30% cash back just for playing poker everyday; but be mindful that only the most high volume players will receive that. The average mid stakes grinder and heavy low-stakes grinder will reach the Gold level and earn 15% cash back without much hassle. Otherwise most other players will be at the bottom 2 tiers and earn less than 15% cash back. Compared to other VIP reward poker rooms its not too bad a cash back rate… it wont be as high as a rakeback site like Americas Cardroom but at the same time you’ll have more access to traffic and potentially a lot of fish. We describe the deposit bonus next which is something we recommend all players sign up and clear. After that if you find the games to your liking then definitely stick around to grind out some easy cash back. As you can see, it doesn’t matter which currency players deposit in, the Party Poker bonus provides an easy 25% cash back. Additionally, new players are eligible to receive entry to the $5,000 Bankroll Booster tournament and this deposit bonus is added on to the VIP rewards cash back players will receive that we described previously. 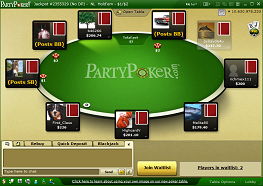 Party Poker has drastically improved its software over the years and now offers a downloadable version of its software for both Mac and Windows users. Don’t want to download? That’s cool as Party Poker also offers a no-download flash version of its software with support for most mobile devices. 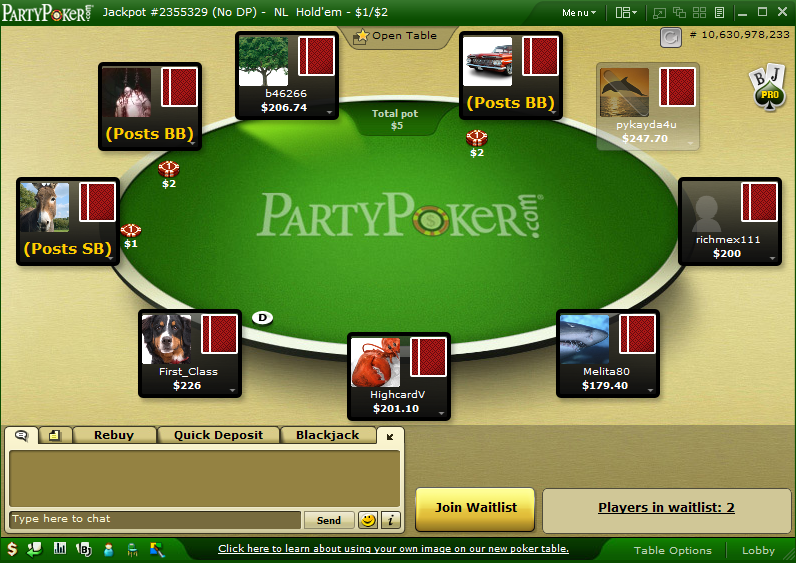 Players will also be able to take part playing with hundreds of other players on the Party Poker fast-fold platform. As we mentioned previously, Party Poker is currently the 5th ranked poker room in the world in traffic but that rank fluctuates wildly. Basically tied with 888 Poker and Full Tilt Poker with 3rd place behind Poker Stars and iPoker, Party Poker has seen its traffic gradually decline over the past 12-18 months. We don’t have a good explanation as to why the traffic keeps decreasing at Party Poker but its partly to do with their poor attitude towards affiliates and the improved poker clients of their major competitors. 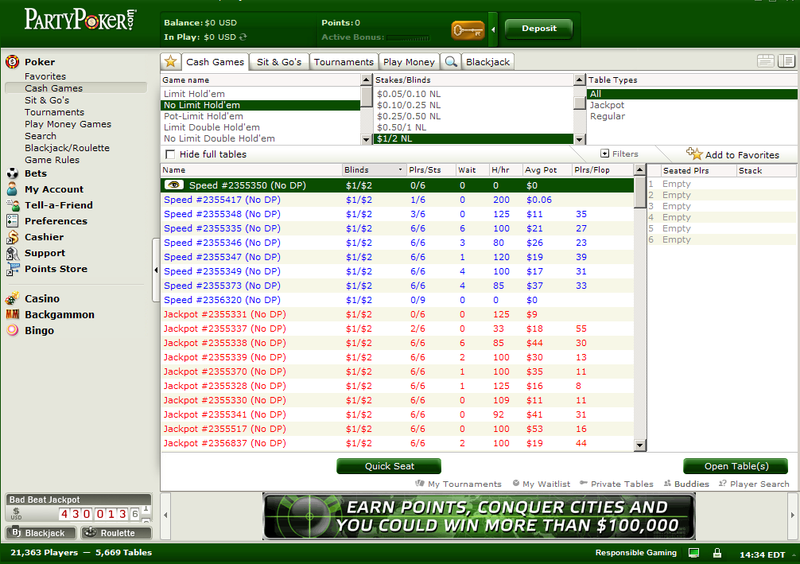 While its traffic has decreased, Party Poker still has traffic and action going at all games at all times of day. While the majority of Party Poker’s cash game traffic is at No Limit Hold’em, Limit Hold’em and Pot Limit Omaha players will not have a problem finding a good table to sit at. Party Poker is not known as having a large MTT following although they were once the king of SNGs many years ago. The tournaments available at Party Poker include WPT National Series Marbella, $5,000 bankroll Booster, WSOP Satellites, GSOP Dominican Republic, Premier League Poker, Spring Million, $200K Guaranteed Sunday, and the $30k Guaranteed Super Weekdays. Party Poker offers customer support available 24 hours a day 7 days a week via email and phone in more than 12 languages. Response via email is actually quite slow but they will eventually respond to all emails. Not surprisingly we feel that Party Poker could improve their support to players but if after 12 years of providing poker they haven’t figured that out yet they likely never will. Banking Options: VISA, MasterCard, WebMoney, iDeal, Click & Buy, ukash, Click2Pay, EntroPay, Skrill, Neteller, Bank transfer, Paypal and many, many more. With powerful software, excellent customer support and an easy to clear deposit bonus, it is not hard to realize why Party Poker is among the best poker rooms. Players will not have trouble finding a good game to play with the significant traffic at Party Poker, and you will likely continue to play to earn the high rewards after you clear the deposit bonus.